Imagine rhododendron blossoms bigger than grapefruits and in every shade from white to pink to red! There were also azalea blooms as big as plums in yellow and orange. Thw annual Rhododendron and Azalea show includes artwork and floral arrangements using native materials such as driftwood and pebbles. The sculpture exhibit is scattered throughout the formal gardens and entrance plaza. 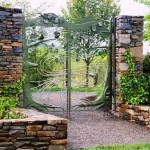 The North Carolina Arboretum is a public institution established by the General Assembly in 1986. It encompasses 426 acres of formal gardens and trails in the Bent Creek Experimental Forest near Asheville. Frederick Law Olmsted, father of landscape architecture and designer o fNew York’s Central Park and Prospect Park, had envisioned an arboretum for the Asheville area almost 100 years ago. The main building houses the Education Cente rand seasonal shows. They offer seminars on different subjects such as Master Gardening, Beginning Bonsai, and herb growing. 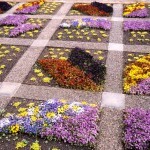 The Quilt Garden is pansies and other small flowers set out in quilt block patterns. It is viewed from a stone viewing stand overlooking the garden. The Heritage Garden consists of plants used in the local craft industry. Included are shrubs used for brooms, basket making, homemade paper, and to make dyes for fabric. The National Native Azalea Repository is a conservation reservoir for native and cultivated azalea plants that are threatened by development. The rare Pinkshell azalea is found in only a few Western North Carolina counties and blooms along the Parkway near Devil’s Courthouse in May. A newly discovered azalea in South Carolina has only 500 known plants, and is not currently displayed in the garden. Landscape shrubs and new introductions flourish in the informal setting of the Plants of Promise Garden. Rock walls and raised beds line the path, and Braille signs are posted at hand height along the way. A pamphlet on bird watching is available at the Education center. Bring your camera and water bottle for the hiking trails.